After a long break, I thought it is time to revitalize my photography stream and ad new articles to my blog. The last days were pretty busy and it was barely impossible for me to keep up with anything on flickr or the blog. It doesn’t mean that I have not done any photos over the last three month. The opposite is the case. But doing a blog seriously takes more time than expected. I plan to start to post again, but reduce the posting cycle. Once or twice a week must be enough and manageable for me. I have a lot of great new content: New photos & new places from Portugal, Netherlands, Germany, Las Vegas, New York & Boston. Different photography technique & styles (e.g. macro & strobist stuff) I applied. I’m eager to share my experiences with you. It is nice to be back. About the photo above: The photo was taken from one of my favorite spots in the middle of the central park on my last trip to NY. 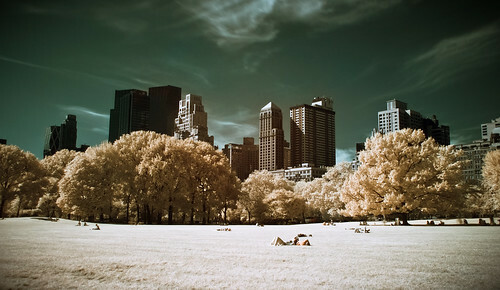 I made an infrared photo of it (More about infrared you find here). The shot is a 10s exposure with a Hoya R72 filter. Afterwards, I swapped the color channels of red & blue. Interestingly, you can see that the trees are not completely white, but more yellowish. The reason for this is, that the R72 doesn’t block all visible light and also some info from the green channel gets into the lens. I like the effect. Magnificent web site. Lots of helpful information here. I’m sending it to some pals ans also sharing in delicious. And naturally, thank you to your sweat! apparently purchasing flats in Bangalore has developed into a distant dream. without offering much in return.